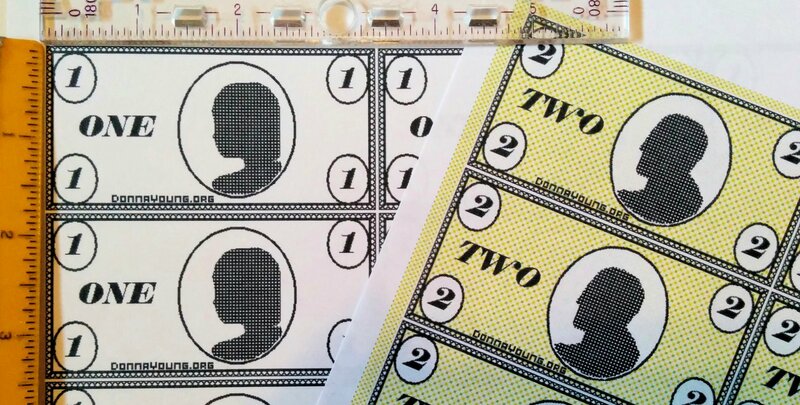 Print game money in two different styles from this page. Each of the two styles is available in both gray scale and color. One of the styles is available in two sizes. The posted dimensions of the individual bills are an approximation. As a subscriber, you are free to print the files from this page as often as you need. The subscription does not include a "download file" that contains all of the files. Otherwise, go to the Basic Subscription Files. Click on this image to see a larger version of the image. 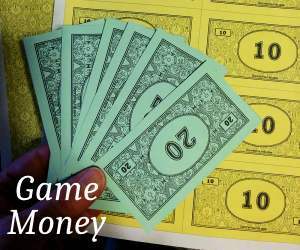 Classic Game Money includes the typical denominations and is a typical game-money size (if such a things exists). 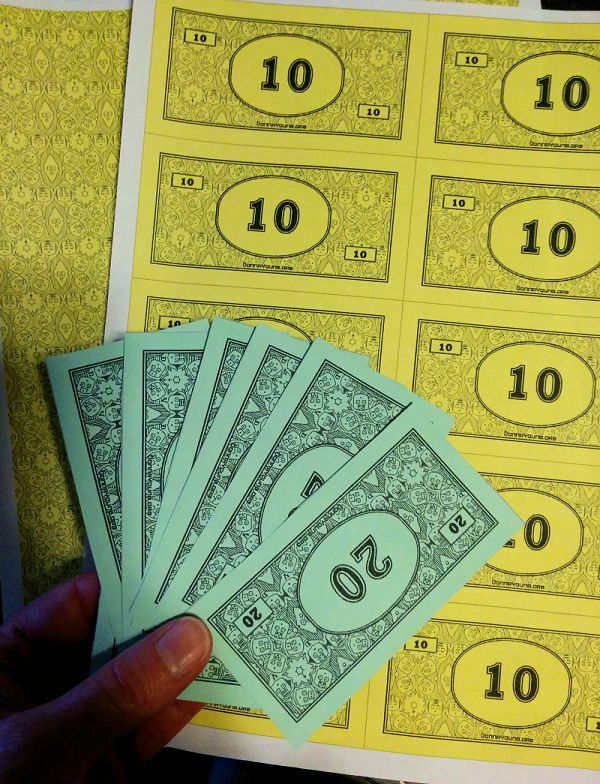 If you need game money and lots of it, then this set might fulfill your game money needs. Size: The bills measure approximately 4 inches wide by just under 2 1/8 inches tall. The metric size is approximately 10.2 cm wide by 5.4 cm tall. Color Bills: Each color version file of the bills is two-pages long. Page 2 is a matching solid color that is meant to be printed on the back of the bills. Alternate Back: A matching print background is available for each color. If you want to print the fancy background, be sure that you do not print page two when printing the color bills. Paper: I recommend 28lb or 32lb weight paper for any of the files on this page. See a File Sample: The 10's with the word Sample written over the file. Of course, the word Sample will not be printed over any of the files below. 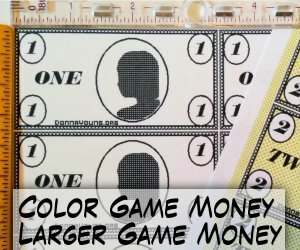 From the sample, you can see the size of the bills and layout of the Classic Game Money. This set, named 15-D after the fifteen different denominations, is available in two sizes, Large and Small. Size: Each large size bill measures approximately 3 3/8 inches wide by 1 11/16 inches tall. The metric size is approximately 8.7 cm wide by 4.4 cm tall. Bills per sheet: Each printed file yields 12 bills. Color Bills: Each color version file of the bills is two-pages long. Page 2 is a matching color that is meant to be printed on the back of the bills. Alternate Black and White Back: I've included an alternate back that is black and white. If you choose to use it for the color files, then do not print page 2 of the color files. Size: The bills are SMALL, approximately 1 1/4" by 2 1/2". Bills per sheet: There are 24 bills on each printed sheet of paper.